: 3 Random Yugioh Holo-graffic cards and new sleeves will be included for Free! 1x Galaxy-Eyes Cloudragon. 3x Cipher Twin Raptor. 3x Cipher Mirror Knight. 1x Neo Galaxy-Eyes Cipher Dragon. 3x Double Cipher. This is a complete Raidraptor deck. In this deck you will be receiving the following cards 3x Raidraptor - Vanishing Lanius. 3x Raidraptor - Fuzzy Lanius. 3x Raidraptor - Sharp Lanius. 3x Raidraptor - Mimicry Lanius. This is a complete Cyber Dragon Deck. In this deck you will be getting the following cards 1x Cyber Dragon Drei. 1x Cyber Dragon Core. 3x Cyber Dragon. 3x Cyber Dragon Zwei. 1x Toon Cyber Dragon. 3x Cyber Eltanin. 3x Pulao, Wind of the Yang Zing. 3x Bixi, Water of the Yang Zing. 3x Bi’an, Earth of the Yang Zing. 3x Taotie, Shadow of the Yang Zing. 3x Yang Zing Prana. 3x Yang Zing Unleashed. 3x Yang Zing Brutality. 1x Brotherhood of the Fire Fist- Buffalo. 2x Brotherhood of the Fire Fist- Raven. 3x Brotherhood of the Fire Fist- Wolf. 1x Brotherhood of the Fire Fist- Bear. 1x Brotherhood of the Fire Fist- Rhino. 1x Brotherhood of the Fire Fist- Hawk. 2x Batteryman Industrial Strength. 1x Batteryman Fuel Cell. 1x Batteryman 9-Volt. 3x Batteryman AA. 2x Batteryman C. 1x Batteryman D. 3x Batteryman Micro-Cell. Extra Deck (1 card). Side Deck Back to the Front (Rare) x2. Number 41: Bagooska the Terribly Tired Tapir (Super Rare) x1. Call of the Haunted (Common) x3. Aroma Jar x3. Mystic Macrocarpa Seed. Seed Cannon. Murmur of the Forest. Humid Winds x2. DNA Surgery. DNA Checkup x2. Super Solar Nutrient x2. Shiranui Spectralsword. Shiranui Spiritmaster x2. Shiranui Samurai x2. Shiranui Smith x2. Shiranui Style Synthesis x2. Shiranui Style Samsara. Shiranui Style Swallow’s Slash x2. Shiranui shogunsaga. Complete Chain Burn Deck! 1x Chain Strike. These cards can be added/switched around with your deck to improve its overall quality! 3x Ring of Destruction (2x Ultra Rare). Trap Cards (26) Monster Cards (10). Dragunity Arma Mystletainn. Dragunity Dux x3. Dragunity Aklys. Dragunity Partisan x2. Dragunity Primus Pilus x3. Dragunity Legionnaire x3. Dragunity Militum x3. Dragunity Javelin x3. Full Yu-Gi-Oh Deck! All cards as shown! Some cards are Speed Duel cards and have the words faintly printed in the text box (see picture). Mithra the Thunder Vassal x2. Lucius the Shadow Vassal x2. Garum the Storm Vassal x2. Escher the Frost Vassal. Edea the Heavely Vassal. Berlineth the Firestorm Vassal. Mithra the Thunder Vassal. Landrobe the Rock Vassal. 3x Cyber Dragon. 3x Cyber Dragon Zwei. 3x Cyber Phoenix. 3x Cyber Dragon Core. 3x Cyber Valley. 3x Cyber Eltanin. 3x Cyber Larva. 1x Cyber Repair Plant. Yugioh Complete Yugi Moto Deck For Casual Play. Condition is Used. Shipped with USPS First Class Package. This deck is built to support the upcoming "Order of the Spellcasters" Structure deck from Konami. Complete list below, unless noted all are commons. Condition varies from Near Mint to Lightly Played. Oricas Yugi Muto Waking the Dragons Deck. Condition is New. - 52 Card Deck, 15 decks available. Ring of Destruction. Y-Dragon Head. - Premium quality cards. Monster Cards. -Extra Deck. The cards in the deck are sleeved. In this deck you will be gettting the following cards 2x Creature Swap. 1x D.D. Warrior Lady. 1x Breaker The Magical Warrior. 2x Giant Rat. 1x Ring of Destruction. Legendary Six Samurai - Kizan x3. Legendary Six Samurai - Enishi. Grandmaster of the Six Samurai. Kagemusha of the Six Samurai x3. The Six Samurai - Zanji x2. The Six Samurai - Yaichi. The Six Samurai - Nisashi. Neo Space Connector x3. HERO Flash! Hero Barrier. Neos Fusion. A great begginer deck! Includes many of the blackwing staple cards. 15 card extra deck. The main deck consists of 17 spells and traps, & 23 monsters. Message for more info and details. (Bonus) 27 monster support cards. Very few lightly played cards. Most are in mint to near mint condition. HERO Flash! Skyscraper 2 - Hero City. Hero Barrier. Hero Signal. Future Fusion. Buster Blader, the Destruction Swordsman. Buster Blader x3. buster blader the dragon destroyer swordsman. Dragon Buster Destruction Sword x3. Robot Buster Destruction Sword x3. Buster Whelp of the Destruction Swordsman x2. Blue-Eyes Toon Dragon. Toon Dark Magician Girl. Toon Summoned Skull. Red-Eyes Toon Dragon. Toon Gemini Elf. Toon Masked Sorcerer. Toon Goblin Attack Force. Toon Cannon Soldier. The cards in the deck are sleeved majority of the cards are in great condition. In this deck you will be gettting the following cards 3x Thestalos the Firestorm Monarch (Super). 1x Mobius the Frost Monarch. Hot Red Dragon Archfiend King Calamity. Red Dragon Archfiend. Red Wyvern. King’s Synchro. Synchro Call x3. Red Resonator x3. Double Resonator x3. Chain Resonator x3. 3x Jiaotu, Darkness of the Yang Zing (Ultra Rare). 3x Suanni, Fire of the Yang Zing (Super Rare). 3x Chiwen, Light of the Yang Zing (Ultra Rare). 1x Chaofeng, Phantom of the Yang Zing (Super Rare). 3x Baxia, Brightness of the Yang Zing (Secret Rare). In this deck you will be receiving all the cards from above. The cards are all near mint to mint condition. This is a complete Performage Pendulum (PePe) Deck. 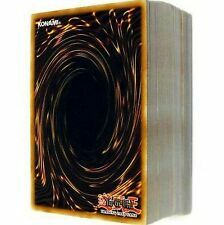 In this deck you will be receiving the following cards 3x Performage Mirror Conductor. 2x Performage Hat Tricker. 1x Performage Trick Clown. 1x Performage Trapeze Magician (Rare). YUGIOH Complete Yusei Fudo Synchro Deck! BUDGET LOOK! Extra Deck (15) These cards can be added/switched around with your deck to improve its overall quality! 1x Monster Reborn. 1x One for One. 3x Crystron Citree (Ultra). 3xCrystron Sulfefnir (Super). This is a Crystron Deck. In this deck the cards are near mint to mint. The following cards are include in the deck 3x Crystron Rion (Super). 3x Altergeist Multifaker (Ultra). 2x Altergeist Silquitous (Super). 1x Altergeist Kunquery. 3x Altergeist Protocol (Super). 3x Altergeist Hexstia (Super). 3x Lost Wind (Rare). Extra Deck 3x Solemn Strike (Supers & Ultra). Armityle the Chaos Phantom. Raviel, Lord of Phantasms. Hamon, Lord of Striking Thunder. Dark Summoning Beast x3. Call of the Haunted. Jar of Avarice. Destiny Board. Complete Masked HERO Deck! 2x Masked HERO Anki (gold secret rare). 1x Masked HERO Dark Law (super rare). 1x Masked HERO Koga (super rare). 1x Masked HERO Goka (rare). 1x Masked Change II. 1x Axe of Fools. 1x Red-Eyes Wyvern. 1x Red-Eyes B. Chick. 2x Tiger Axe. 1x Axe Raider. 1x Panther Warrior. 1x B. Skull Dragon. 1x Alligator's Sword Dragon. 1x Thousand Dragon. 1 x Red-Eyes Wyvern. 1 x Proxy Dragon (Ultra). 1 x Red-Eyes B. Dragon (Ultra). 2 x Red-Eyes B. Dragon. 1 x Dragon Knight of Creation (Super). 1 x Dwarf Star Dragon Planeter. 1 x Res-EyesRetro Dragon. 1 x Ruins of The Divine Dragon Lords (Super). Evil Hero Infernal Prodigy. Evil Hero Infernal Gainer x3. Evil Hero Malicious Edge x3. HERO Flash! Evil HERO Inferno Wing. Evil Hero Dark Gaia. Dark Fusion. Call of the Haunted. Paypal only. USA only. :) If you ask for it when you order, I will include a 3rd Skull Servant common card from a random set. Shipped USPS First Class mail wIth FREE TRACKING/INSURANCE. Listing is for a compete 40 card Skull Servant. Cards range in condition, but I’d guess most are light play. The 3 Wightmare and Ultra Allure of Darkness are Near Mint. Comes with purple Ultra-Pro sleeves/deckbox. In the rare case that there are any issues, please contact me before leaving feedback, and I’ll do what I can to make it right. Please remember to leave Positive Feedback! Questions? Ask! 3x Cipher Wing. 3x Cipher Etranger. 3x Cipher Mirror Knight. 3x Cipher Twin Raptor. 3x Rank-Up-Magic Cipher Ascension. 3x Cipher Bit. 3x Cipher Spectrum. 3x Double Cipher. 3x Gogogo Golem - Golden Form. 3x Gogogo Gigas. 3x Gogogo Golem. 3x Gogogo Giant. 3x Gogogo Ghost. 3x Gogogo Goram. 3x Gogogo Talisman. 1x Number 55: Gogogo Goliath.